The international break has well and truly kicked in, but we don't have long until our favourite red and white team are back in action. The North London derby, an early kick-off on Saturday, will knock any cob-webs away. 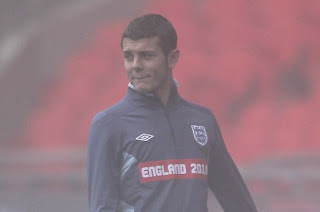 Ahead of the game, we have injury concern over Jack Wilshere. I don't know quite what's wrong with him. Fabio Capello doesn't say anything apart from the player is "going home"... home appears to be Colin Lewin's treatment room! The Daily Mirror suggest his withdrawal is down to a knock picked up against Everton. Anyway, we'll have to keep our fingers crossed and wait for an update from Arsene Wenger tomorrow as to how the player is. I hope he can make it, just so we can have the option of playing him. But I wouldn't mind if we started with Denilson. He's done well whenever he's been called upon this season. Just whilst I'm on international football, Henri Lansbury ended up playing in goal for England Under-21s last night. By the account I've read he did well when put between the posts. Although I'm sure the Arsenal goalkeepers won't be losing any sleep over Lansbury's fine display. One member of the British Royal family was celebrating yesterday the news of the decision of a person he admires so much making a commitment to him. Prince William couldn't contain his joy as Aston Villa took the plunge and signed Arsenal legend Robert Pires until the end of the season. I feel a bit sad for Kate Middleton. Really overshadowed her day when it was announced she would become engaged to the future King. And on to the talking point today. It appears that Bayern Munich might really have an interest in Nicklas Bendtner is the comments of Franz Beckenbauer are anything to go by. Beckenbauer is on the club's advisory board and was asked whether Bendtner could fit into the Bundesliga team. Beckenbauer, speaking at the Danish Football Player of the Year Award Show in Copenhagen, said. "[Bendtner] is among some players, who have done very well - both for Denmark and for his club, and who has got the class and the potential to play in a club like Bayern Munich, where we already have a lot of class players." Now remember where he's speaking... I think that says a lot. If he wasn't saying what he was saying in Copenhagen, I think it would add more weight to the story. But what's he really going to say in front of a crowd of Danish people about one of the most promising footballers they've seen produced in a long time? That he's not good enough to play for Bayern and his ego wouldn't fit in the dressing room. I don't think if he said that it would go down too well. And it's hardly a ringing endorsement. You could say the same about a lot of players. In any case, I don't think Bendtner is going to leave. He wants to stay and fight for his place. And there is no way Arsene Wenger is going to sell him. He knows that Bendtner's time will come. The player just has to be patient. There's a weird story going round about Arsenal moving for Ashley Young in January. Started by talkSPORT, I don't really know which party it's come from: Villa, his agent or us. It could however be wild speculation and someone putting two and two together and making five. I gave my view on Twitter yesterday. And finally for today, keep those fingers crossed for all our players on international duty. The official site has a list of who's involved and where.